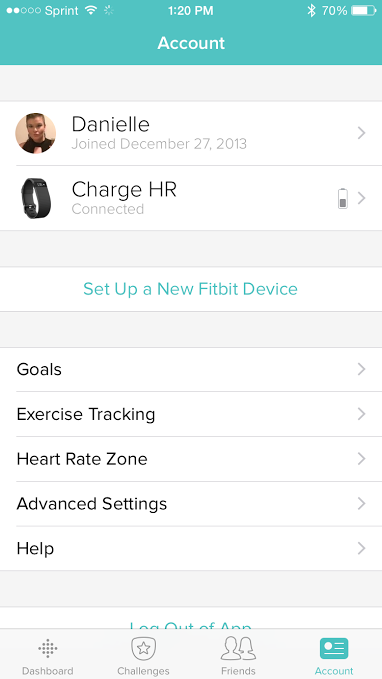 I told Kevin I wished I could exchange my fitbit flex for the charge HR and just pay the difference. He told me that since I actually wear it every day and use it to just go buy the Charge HR. So, I did. And I’m in love with it. I thought I’d do a review on it. These are solely my own views and opinions. 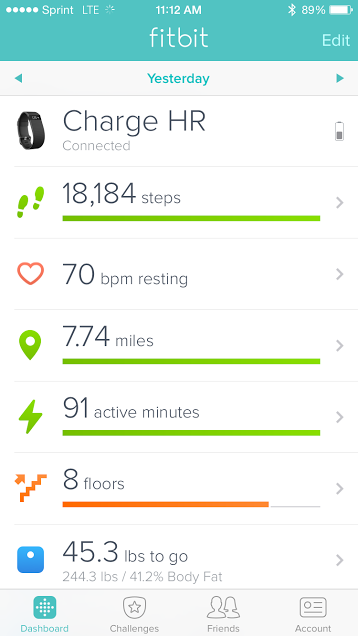 I’m NOT working with FitBit in any way, shape, or form. I’ve had a bunch of people asking me how I like it. So, here goes!!! 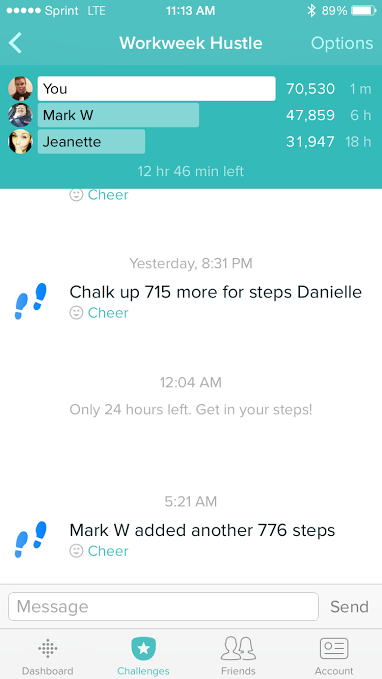 I took some pics of the app in all of its glory for those of you without a fitbit at all. A few things you should know. *Since I’m training for that half marathon my steps are WAY up. It’s kinda ridic. *Fridays and Sundays are my rest days because my long run is on Saturday. 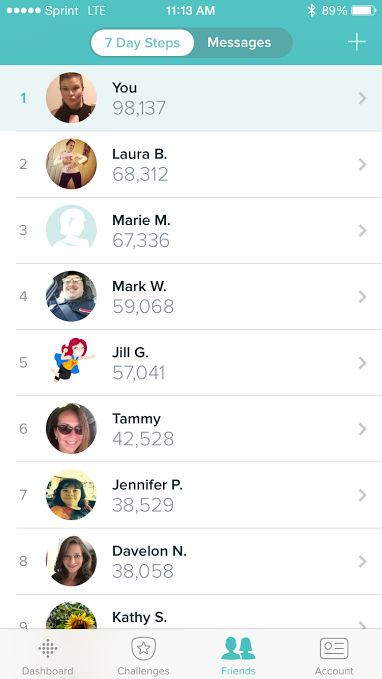 *I’m using my fitbit for solely the fitness portion since I’m following WW. This is what the app looks like when you open it up. I love the user friendliness of it. You can track as much, or as little info as you want. I only follow what’s on the left, but wanted you to see it all. You can take as many of these sections off of the display as you want, or keep them, too. You do you, boo. I have (and do) use the exercise option (above right) when I do my long runs. Otherwise, I always forget, but my long runs are real talk now and I have to actually prepare or else I die a little inside. Since I do Weight Watchers I don’t really feel the need to track my calories (though I have via MyFitnessPal and I have synced the two. It works GREAT.) I drink more water than I probably should so I don’t feel the need to track that. Sometimes I wear it when I sleep and sometimes I don’t. You can view your information in a pretty detailed aspect. You can even go a step further and see when the bulk of your activities were taken. 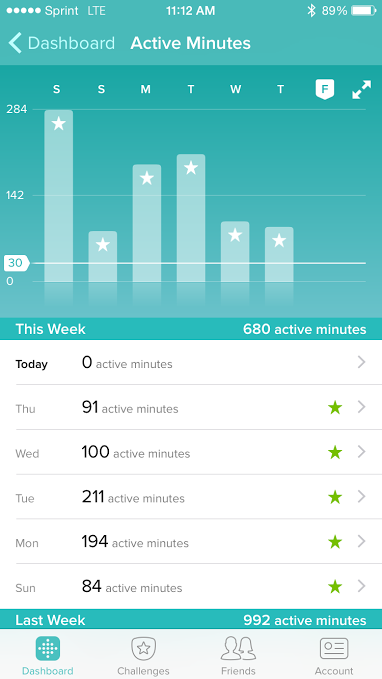 The FitBit Website explains how they calculate active minutes in detail: here. 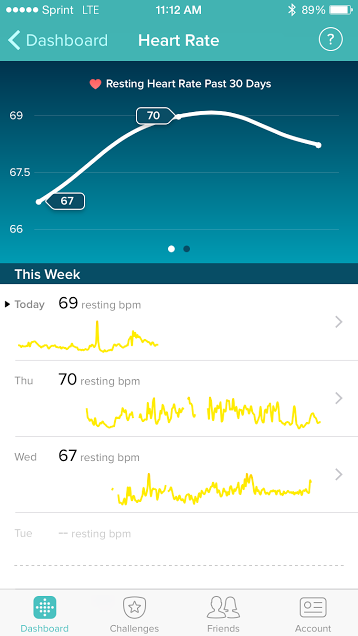 I am still learning the heart rate aspect, but this is why I actually wanted it. I’ve been working on keeping myself in the “fat burn” zone while training and not staying in the cardio aspect. 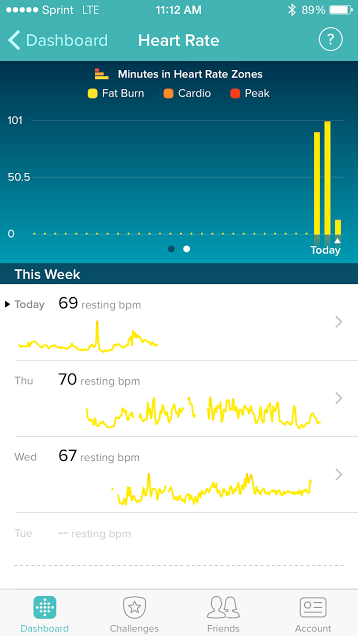 Also, when I was doing tris, my resting heart rate was 60. I’m trying to get it back down to that with more endurance training. These are the settings. 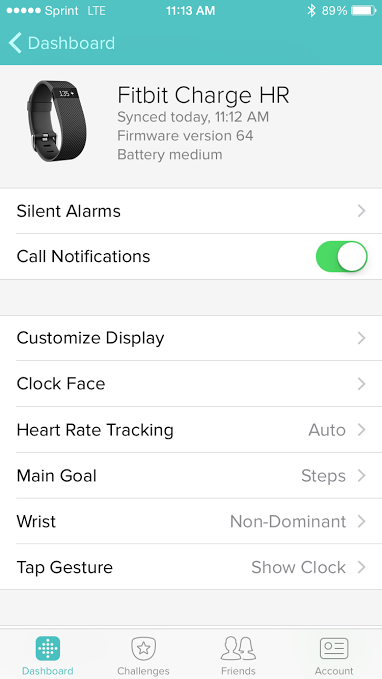 A REALLY cool feature that I love about this one is that has call notifications, which means it’ll pair with your phone and your wrist will vibrate when you get a call and it will scroll/flash who is calling. What’s neat about this is that when I’m running I can look down at my wrist and determine if I want to take the call instead of trying to pull my phone down off of my upper arm where it stays mounted the whole time. Also, your phone could be in your purse and you can see who’s calling on your wrist, in a meeting, etc. 1. The HR Monitor is painful. I honestly think those people bought a small when they should have bought a large. (There is no medium.) 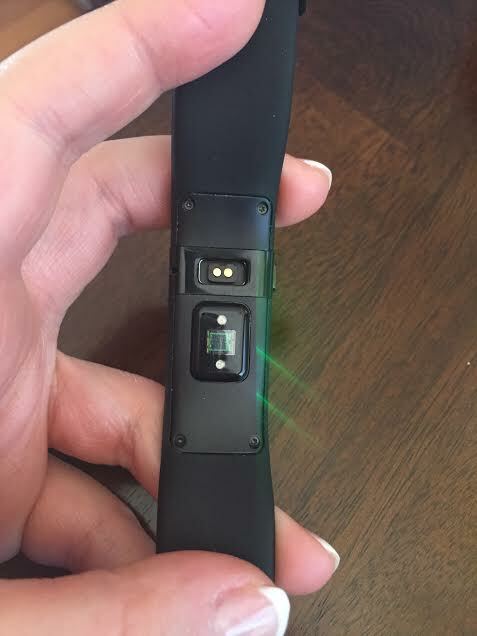 Ladies, it’s a fitbit, not a dress. No one is judging you for buying a small when you know you should have bought a large. Hell, I bought the small originally and while it fit it was snug when I slept and on the last setting, so I took it back for a Large. 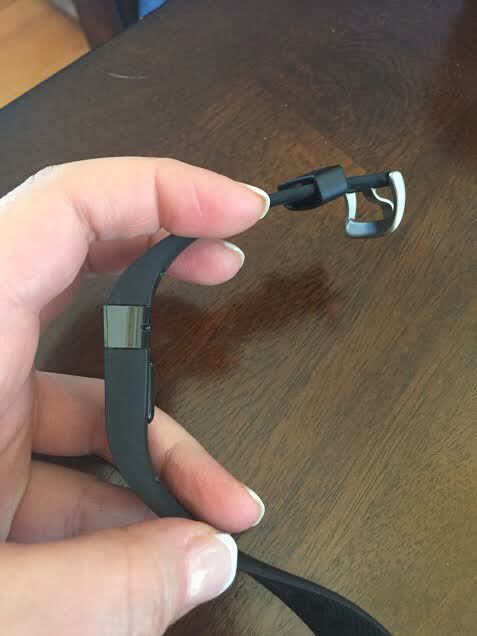 It’s also suppose to sit about an inch down from your actual wrist (which the package doesn’t say). (If you do plan on sleeping with it, you’ll want to wear it loosely, otherwise you’ll lose feeling in your hand while you sleep and wake up totally horrified. Real talk.) You can see below that the monitor does protrude a little bit, but they are soft rounded corners and not enough to actually hurt you unless you are wearing it so tight that it is crushing your bones. 2. The plastic scratches. Y’all plastic scratches. Take care of your stuff. I’m not sure what else to say. I never had an issue with the plastic scratching on the flex and this is very similar. 3. The steps are inaccurate. Not to my knowledge. I’ve actually found it pretty accurate. 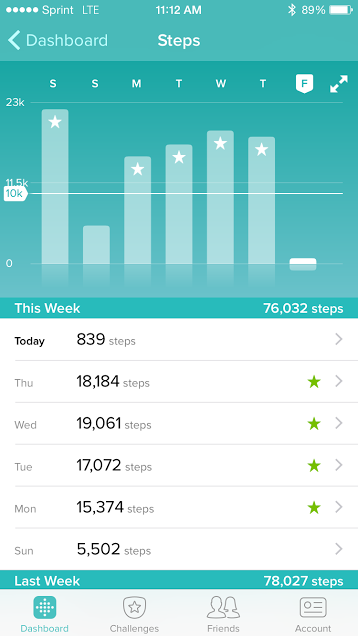 I use my running GPS and my fitbit when I run and I’ve never noticed a gross difference. I thought about getting the FitBit Surge (has GPS in it and on the display) but it’s significantly bulklier on your wrist and that will drive me crazy. It’ll stick to my two devices to get the job done. Overall, my only complaint is that I wish it were waterproof. That’s it. That’s all I’ve got so far. I’m super jealous! 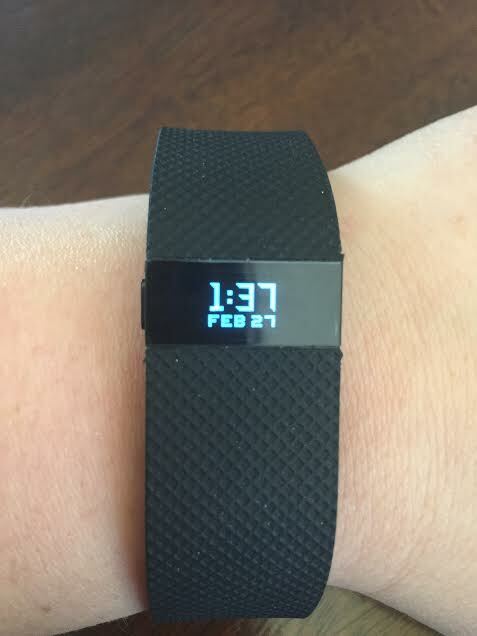 I ordered my Fitbit HR the day before it was advertised on the website that it was coming out in the beginning of Jan., and I have yet to receive it. I’m also a little peeved because I was an “in-between” size so I went to the XL just to be on the safe side… sooo I can’t even cancel my order and go to like, Target, and get one. Grr. Hopefully it’ll come one of these days. I can’t wait to use it!!! I have a plum ChargeHR on order (currently have One, used to have a Force). 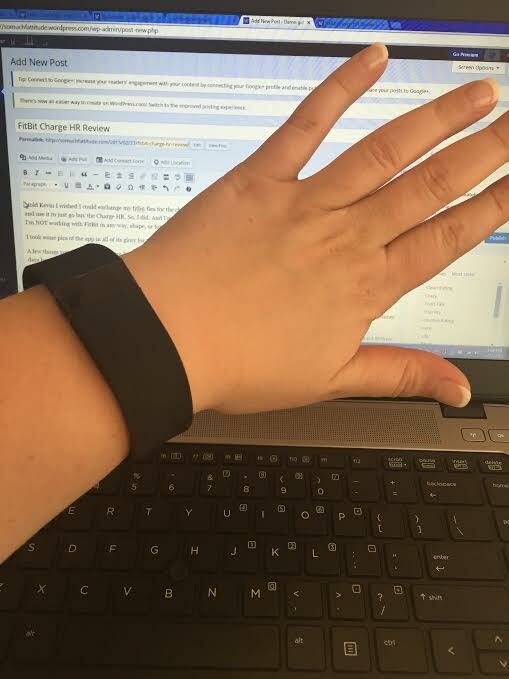 The big knock on the ChargeHR is that for certain activites the HR monitor is wildly off. The types of activities that people say can be as much as 30 beats off (on average) are low movement exertion (like weight lifting) and movement with sharp changes in exertion such as intervals. Most say it works pretty well for them if you are doing something at a steady pace (although some have problem if it is something that is high heart rate, but others don’t). If you look at the official discussions there are a bunch of threads on it. 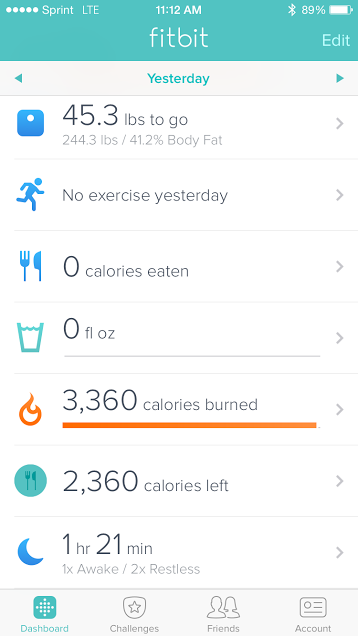 I finally decided I would the HR function to get better non-exercise calorie burn and I during exercise that it doesn’t count well I would keep doing what I’m doing now which is wearing a HRM and sending info to Digifit to overwrite the Fitbit calorie info. I’ll be interested to hear what kind of HR accuracy you get particular on strength training or intervals.